Imports of fresh fruit into China continued a trend of strong growth in 2018. Through the first 11 months of the year, imports into China for goods in the category of edible fruits and nuts totaled 5.16 million tons, with a value of $7.58 billion. These figures represent a rise of 25.7% in volume and 34.4% in value compared to the same period a year earlier. Key factors influencing imports of fresh fruits into China in 2018 included continuous growth in Chinese consumer demand for fruit, expanded market access in China for more types of fruit from new regions, faster customs clearance, the ongoing trade friction between China and the US and new Chinese MRL standards. In 2018 ten types of fruit gained approval for import into China, down from 17 new types in 2017. Most of these approvals came in the latter half of 2018. Specifically, the fruits that gained approval for export to China in 2018 were: Uruguayan fresh blueberries; Kyrgyzstani fresh melons; Argentinian fresh blueberries and cherries; Laotian bananas; Cambodian bananas; Philippine coconuts; Panamanian fresh pineapples; Spanish table grapes; and Portuguese table grapes. Of these, the products that currently hold the greatest potential for strong sales in China are coconuts from the Philippines, bananas from Laos and Cambodia, and table grapes from Spain and Portugal. Coconuts have especially seen explosive growth in China over recent years. Thailand is the current primary exporter of coconuts to China and its exports rose from $1,000 in the first ten months of 2013 to $25.59 million over the same period in 2018. The expanding market for coconuts in China presents a good opportunity for coconut suppliers from the Philippines. Laos and Cambodia have previously exported bananas to China through grey channels, but the official market access will mean exporters can send their bananas through official channels. Although their plantation area is dwarfed by China's domestic banana plantation area, those two countries have good climates and produce high quality bananas. Spain, with Europe's largest grape plantation area, also has a good opportunity in China, where it will be counter-seasonal to many of the other major exporters of table grapes to China, like Chile, Peru, Australia and South Africa. Although Spanish grapes will face a 13% tariff in China, it's nevertheless a lot lower than the 53% tariff currently being imposed on US table grapes coming into China. Trade frictions between China and the US increased started in March of 2018 and increased for most of the rest of the year, with multiple rounds of China issuing increases in tariffs on US agricultural products, including most or all fresh fruits, dried fruits and nuts. According to relevant industry associations in the US, 2018 fresh grape exports to China were down 41.6%, apple exports to China were down 33%, cherry exports were down by almost half, and almond exports dropped 5%. Although the two sides reached an agreement on December 1 to stop further escalations, these tariffs continue to remain in effect. One important result of a round of bureaucratic restructuring that began in March of 2018 was that the import quarantine and inspection functions of the General Administration of Quality Supervision, Inspection and Quarantine (AQSIQ) were folded into the General Administration of Customs of the People's Republic of China (GACC). This merging of inspection and quarantine with customs, along with subsequent reforms to import procedures, have lowered customs clearance times, which especially benefits imported fresh fruit. As of August 1, GACC merged customs and quarantine declarations into a single customs clearance form. And, in September, GACC announced that by the end of 2018 it would cut customs clearance times by a third to 65 hours while also introducing "green channels" with faster clearance times for agricultural products and fresh goods. 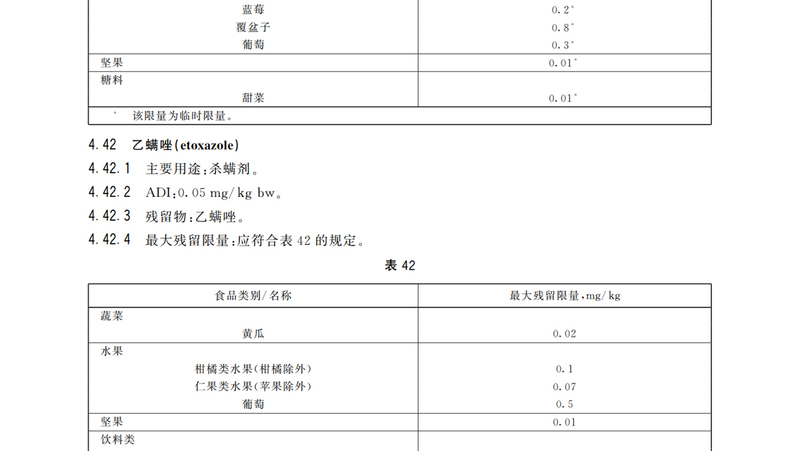 On June 21, authorities in China issued a new set of national standards (GB 2763-2018) titled "National Food Safety Standards | Maximum Residue Levels in Food Products for 43 Types of Agricultural Chemicals Including Paraquat." Maximum residue levels (MRL) established for seven of the chemicals listed in these standards are aimed primarily at setting MRLs for fruits and vegetables (MRLs for other chemicals on the list mostly have to do with animal products). These chemicals are flutriafol, fluopicolide, mandipropamid, trifloxystrobin, spinetoram, etoxazole, and fenpyroximate [Note: these chemical names come from the English names listed alongside the Chinese name of each chemical in the officially published standards, which can be downloaded by clicking this link]. The new standards came into effect on December 21st and apply to imported fruits entering China. Suppliers should work with their import partners to understand and make sure they are in compliance with the new standards as soon as possible. New soil pollution control and remediation legislation also came into effect on the first of the year, which could have implications for any party producing agricultural products domestically in China.